Myself and Philomon, the head chef and camp manager of the Serena Hyena Camp. 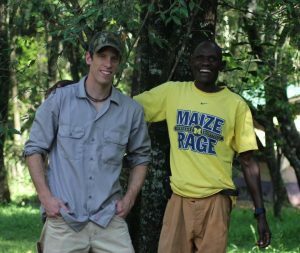 During my time in Kenya, I came to see Philomon as a source of social support and dear friend. The notion that our social environment is important to our health and well-being is not new. There are profound and heartbreaking historical illustrations of how social interactions (or lack thereof) shape behavior and physiology. For example, adults who once resided in Romanian Orphanages, notorious for their depraved lodging conditions and neglect, exhibit severe psychoses and debilitating mental disease 1,2. Likewise, famous primate studies from the 50’s and 60’s demonstrated the importance of maternal touch and interactions with peers to healthy psychosocial development 3,4. However, despite the flurry of convincing correlative results linking the early social environment to future stress-related disease, the underlying molecular mechanisms remained poorly understood until the mid 2000s when Drs. Michael Meaney and Mose Szyf showed that DNA methylation (a stable epigenetic mechanism that alters gene expression without changing the nucleotide sequence) is both responsive to social stimuli and has a direct effect on stress phenotype. These scientists found that offspring born to mothers who did not engage in licking and grooming behaviors had higher methylation of the glucocorticoid receptor gene, which resulted in an inability to respond to elevated stress hormones. The elegant part of this study was that cross-fostering (e.g., switching the rat pups at birth between high licking and grooming and low licking and grooming moms) revealed that the effects of DNA methylation were not due to genetics, but rather, a direct effect of maternal care during the first few postnatal weeks 5. A snapshot of Bart, a dedicated mom still nursing her nearly full-grown cubs. This photo highlights the extent to which hyena moms care for their young, even when they are rapidly catching up in size! Several aspects of spotted hyena biology make them a powerful and relevant study population for my research interests. First, hyena cubs depend on their mothers for nourishment and protection through 2 years of age, presenting a window of opportunity to quantify a variety of novel measures of mother-offspring interactions. I am collaborating with Julia Greenberg, another PhD student in Dr. Kay Holekamp’s lab, to quantify patterns of maternal care using archived behavioral data. We are interested in the proximity of mothers to their young, time spent nursing, and frequency of grooming. Second, in addition to living in clans, hyenas hang out in cliques within each clan. 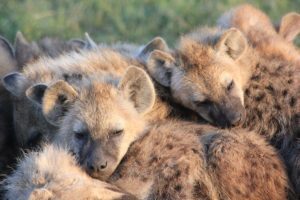 Our detailed observational data regarding the number of individuals in a clique, the nature of interactions within group-members, and the amount of time spent together can be used to quantify unique aspects of a hyena’s social support system (see a previous post by Julie Turner). This notion that social support is critically important to well-being has been found in both non-human primate and human studies where both mothers and their babies are in better condition when social support is stronger 6–8. Finally, hyena societies follow a strict and well-defined rank system, which is of particular interest to me because it is analogous to socioeconomic status in humans; rank determines access to resources, friends, and mates. Thus, findings regarding the relationship between rank and stress phenotype in hyenas may be relevant to studies of socioeconomic position and health in humans. 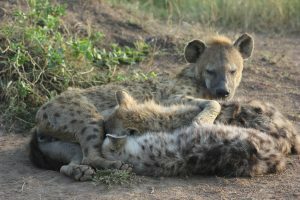 A pile of hyena cubs keeping each other company, dozing off after a long bout of play. Spotted hyenas are wild, gregarious, and perhaps not all that different from other social species (like non-human primates and even humans). Another reason why I am interested in this species is because most epigenetic research to date has taken place in highly controlled rodent and primate populations, limiting generalizability of findings to gregarious animals. Dr. Holekamp’s study population, therefore, represents a unique opportunity to explore how naturally occurring social behaviors correlate with epigenetic mechanisms and stress outcomes in a wild species exhibiting complex sociality. One huge hurdle that I’ve encountered thus far revolves around the task of carrying out epigenetics research in a species whose genome is not yet publically available (NB: the genome of the spotted hyena was sequenced and annotated years ago, but the Beijing Genome Institute has not yet released it). Fortunately, with the help of experts at the University of Michigan and at the University of Minnesota, I was able to sequence the region of interest (the glucocorticoid receptor promoter) using a technique known as multi-species alignment. In brief, I identified a sequence of hyena DNA that is comparable to the established target region in humans and rats. Next, I mapped the sequence to genomes of species in the same order as hyenas (Carnivora) – namely, the cat, dog, and walrus. Then, with a touch of bioinformatics, I sequenced the region in hyena DNA so that we could measure a comparable set of epigenetic marks to those identified in the rodent and primate literature. In addition to gene-specific epigenetic marks, I am also measuring genome-wide methylation content, which can be thought of as a proxy for an individual’s genomic stability and overall condition. Taken together, I hope that the measures of gene-specific and genome-wide epigenetics will shed light on how early social experiences shape adult phenotypes. Preliminary results and what’s in store. Based on our initial work, which showed strong effects of a hyena mom’s rank on her offspring’s genome-wide DNA methylation, I suspect that inter-individual relationships and social status interact in ways that profoundly affect phenotype. The ways in which social experiences affect biology is relevant not only to health of individual organisms, but also has potential to impact how natural selection shapes phenotypes over time. The latter is of particular interest to me, as it implies that social experiences play a role in evolution. It is my hope that what we learn from animal models like hyenas, primates, and rodents will compel us to step back, and consider that humans are also merely animals whose behaviors, physiology, and health are shaped by social experiences. However, unlike other animals, we are uniquely endowed with the capacity to recognize the impact of our social experiences on our biology and how they may transcend generations. Knowing this should motivate social support, and the impetus to move beyond I-llness to WE-llness 9, especially in a world championed by individualism. Chugani HT, Behen ME, Muzik O, Juhász C, Nagy F, Chugani DC. Local brain functional activity following early deprivation: a study of postinstitutionalized Romanian orphans. Neuroimage. 2001;14(6):1290-1301. doi:10.1006/nimg.2001.0917. Kaler S, Freeman BJ. Analysis of environmental deprivation: cognitive and social development in Romanian orphans. J Child Psychol Psychiatry. 1994;35(4):769-781. doi:10.1111/j.1469-7610.1994.tb01220.x. Harlow HF, Harlow M. Learning to love. Am Sci. 1966;54(3):244-272. http://www.pitzer.edu/academics/faculty/banerjee/psyc109/readings/w1-Learn.PDF. Accessed August 21, 2014. Harlow HF, Zimmermann RR. The Development of Affectional Responses in Infant Monkeys. Proc Am Philos Soc. 1958;102(5):501-509. Weaver ICG, Cervoni N, Champagne FA, et al. Epigenetic programming by maternal behavior. Nat Neurosci. 2004;7(8):847-854. doi:10.1038/nn1276. Campos B, Schetter CD, Abdou CM, Hobel CJ, Glynn LM, Sandman CA. Familialism, social support, and stress: positive implications for pregnant Latinas. Cultur Divers Ethnic Minor Psychol. 2008;14(2):155-162. doi:10.1037/1099-9809.14.2.155. Silk JB, Beehner JC, Bergman TJ, et al. The benefits of social capital: close social bonds among female baboons enhance offspring survival. Proc R Soc B Biol Sci. 2009;276(June):3099-3104. doi:10.1098/rspb.2009.0681. Silk JB, Beehner JC, Bergman TJ, et al. Strong and consistent social bonds enhance the longevity of female baboons. Curr Biol. 2010;20(15):1359-1361. doi:10.1016/j.cub.2010.05.067. This entry was posted in BEACON Researchers at Work, Notes from the Field and tagged animal behavior, BEACON Researchers at Work, Epigenetics, Field Biology, hyenas. Bookmark the permalink.